The A6|2m driver provided with the device has not worked since Mac OS-X Lion (10.7). I have written a replacement driver for Audio and Midi usages, from Lion to present (High Sierra). The audio outputs and midi work well, however there appears to be an issue with audio inputs on Sierra and High Sierra (A62m only). Please note, this driver is for the A62m device (6 inputs 2 outputs). It is not for the A26. A new driver for the A26 can be found here. To install the driver you will need to obtain and install files as detailed below. When finished you will have the following files installed (shown with yellow shading). I have circled the size of bitsream.HEX because the size is important. There are many "wrong" versions available on the internet. If yours is about 190 KB you have the wrong file. Before you begin, ensure you are logged into an admin account. You can check whether your account is an admin account through Users & Groups in System Preferences. “Allow user to administer this computer” should be checked. Locate the A62M folder in the /Library/StartupItems folder on your hard disk. Copy the bitstream.HEX, loader.HEX and midi.HEX files to a safe place (eg. your desktop). You can reuse these files in the steps below, instead of downloading them from the internet again. Remove the old A62M folder and reboot your machine so that the old program is no longer running. (If you know how to find and kill the A62M process you may do this instead of rebooting). Download the archive from this link. When expanded it produces an A62M-v2 folder containing two files and one 'A62m' folder (containing one file of the same name). Make sure the name of the folder on your desktop is “A62M-v2” exactly. If it is not, rename it. Also ensure the A62M-v2 folder is on your desktop and not somewhere else. A step below expects to find it on the desktop with this exact name. (You may remove the folder after successful installation). The .HEX files shown in the above image are the firmware for the A62m device. These files are copyright, so I have not included them in the zip file. They are not hard to find on the internet, but every bitstream.HEX file I found using Google was the wrong file. 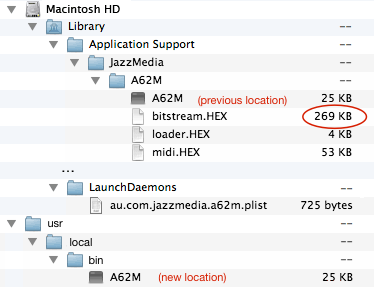 Reading various blogs, it seems bitstream.HEX for the A26 has been mistaken as the A62m file of the same name. The A26 file is approx. 190 KB. The correct A62m file is approx. 270 KB. The files can be found at many locations, including here. If you use this address, after clicking on the relevant file link (which takes you to a new web page), click Download (on the right) to save the file. Get loader.HEX, then go back and repeat for midi.HEX. Do not get bitstream.HEX or spdif.HEX. (The first is the wrong file, and my driver does not support spdif.HEX). Please note, this website keeps changing its interface. You might need to play with the above instructions to get the files. A correct version of the bitstream.HEX file can be found at http://code.metager.de/source/xref/linux/stable/firmware/emi62/bitstream.HEX . Click the 'Download' link at the top of the page to download the file. Check to see if your browser has added ".txt" to the end of any filenames and remove them if it has. Safari added them for me. It is safest to check the file names using "Get Info" in the Finder. (Alternatively: all three files can be found here, however you need to click each file in turn, then click the 'raw' button, and save the raw page into a text files. Repeat for each file). Place all three .HEX files into the A62M folder found within the A62M-v2 folder on your desktop. Your files and folders should now reflect the picture shown at the start. That's it. No need to reboot. The driver takes several seconds to upload the firmware. Between 10 and 20 seconds is typical. You can use the Sound Control Panel to check that the firmware has been uploaded successfully. me if you find any mistakes with these instructions. One more thing. I have responded to many emails for assistance. Almost every time the problem has been a result of people not following the instructions carefully. Please follow the instructions carefully. Here's an FAQ which may also help.